My BF, Helene at I'm Living Proof That God Has a Sense of Humor along with 3 Bay B Chicks & Domestically Challenged have joined together to celebrate art and being creative. Together, they are sponsoring an event called "We Heart Art" this week only, which gives you the chance to not only showcase your artwork or creative projects, but also your kid's handiwork. You can read the kick-off post here. Prizes for children and adults will be awarded to a few lucky winners selected at random. The Semi-Slacker kids love art! Lately they have been showcasing their talents by painting flower pots (& the driveway) & sidewalk chalk(ing the porch)! Whatever their medium of choice, you can guarantee they will get some of it on themselves! Sassy is a wonderful photographer. 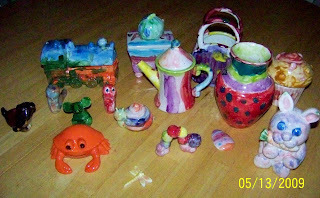 And with the help of her gifted art teacher she has created some beautiful things. Bo is a talented vocalist. His real talent is architecture. That's NOT paper! It's her bedroom wall. She was suppose to be sleeping! I must have been blogging. Seriously, our favorite thing to do when our creative juices start flowing, is take a trip to "the pottery painting place". While I love for them to make a mess, I mean be creative at my house, it's even funner if someone else has to do the work! Here's a sampling of the children's creations. This is one of my favorite pieces. It's even dishwasher safe! We have big plans for a CREATIVE summer! And I will be checking out all the other We Heart Art posts for some great ideas. I draw the line at Play-Doh. Love the art work. I have had some of the same on my walls and even my kitchen table. I learned just this week that I need to draw the line at play doh, too. No more of that stuff in my house! I love baby girl's wall the best. So sweet. My girls love the pottery place too. 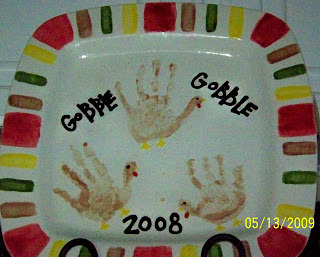 I like the platter with their hands. You are so creative! I seriously love those platters! super cute I am going to play along as well! Aw I love Play Doh! Love it more now because I have no carpet. If I had a dime for every not on paper art my kids have created for me I would be a rich woman. 2~ The pottery is fantastic. I have been promising my oldest I would take him to pottery shop, and seeing this made me eager to do so. Thanks for sharing! 3~ I see that you have a pet turtle? Awesome! So do we! 4~ Yes, I always use way to may exclamation marks! Sorry! 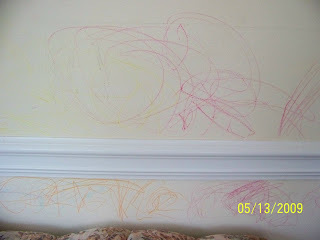 We had to nip the wall art in the bud by leaving plenty of paper in my daughter's bedroom. *squeel! 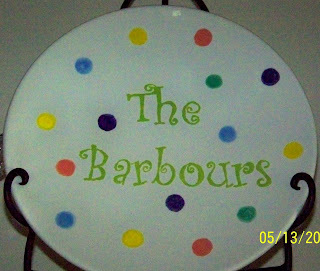 * I really love their pottery! 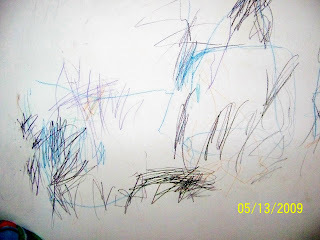 I see everyone's little kid art on their blogs and I just can't wait until my little dude is old enough! FANTASTIC stuff! Love the plates -- and of course, the wall art just takes the cake! I draw the line at Play-doh too. lol. Although I have had my fair share of wall art. Love the pottery too. Congrats on winning. Your house is one big canvas! Wow!! !